We are delighted to introduce you to Golden Pippin, one of our first bears of the New Year. 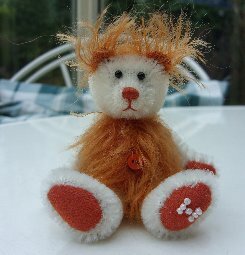 He is 3 1/2" tall and is made of very short, velvety soft, white Schulte mohair. To contrast with this fur, we have used long, straight, fox red German mohair for his body, front and back, and his ears. This gives him a bright cheerful appearance and wonderful whispy long ears. His pads and paws are deep terracotta coloured ultrasuede, he has a terracotta stitched nose and shiny black English glass eyes. We have filled Golden Pippin, who I am sure you have guessed is part of our Apple varieties collection, with steel shot for weight. He is a very cute little bear with a sweet face. I do hope that you like him, he costs only £35 plus postage. Please note that as with all our bears, Golden Pippin is not a toy and is not suitable for children. Sorry - Golden Pippin has been adopted.